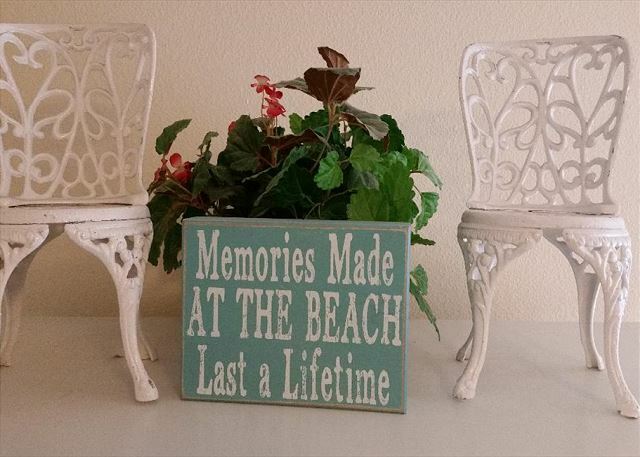 Step outdoors to nap on the comfy beach chairs. Just outside the kitchen, you'll find the gas barbecue. This wrought iron table provides the perfect setting to enjoy a morning danish, while soaking in the view. 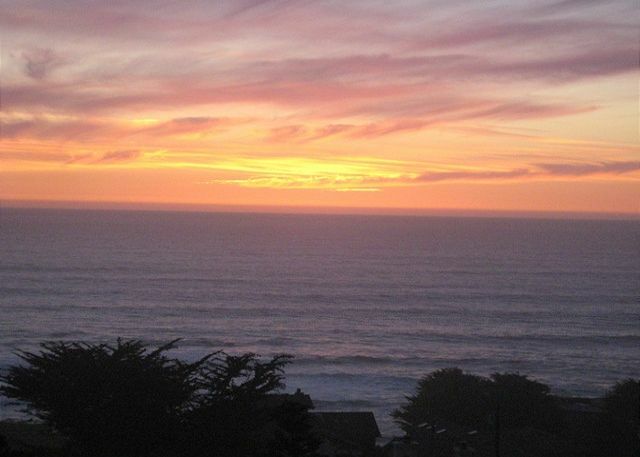 One of the best features of Cambria is the sunset each night. The windows and deck space of this home provide the perfect place to take it all in. Feast your eyes on the expansive view from the deck. The view stretches from Cambria's Park Hill to the Piedras Blancas lighthouse. 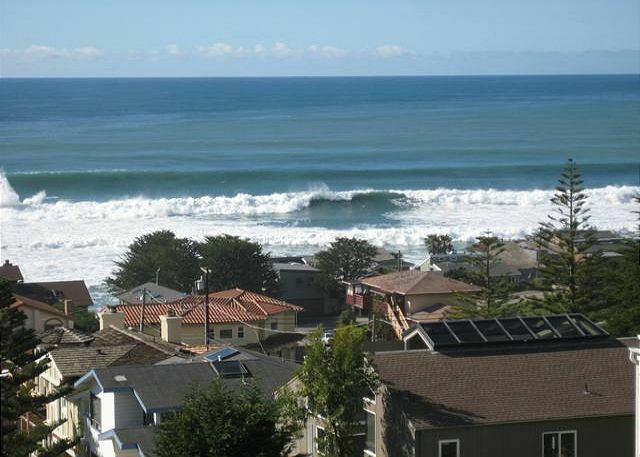 Enjoy the magnificent views which expand from Cambria to San Simeon. You are close enough to the ocean to feel the cool breeze and hear waves crashing. There is nothing like standing on the deck to watch for seasonal waves changes. Surf's up! AWESOME VIEWS! 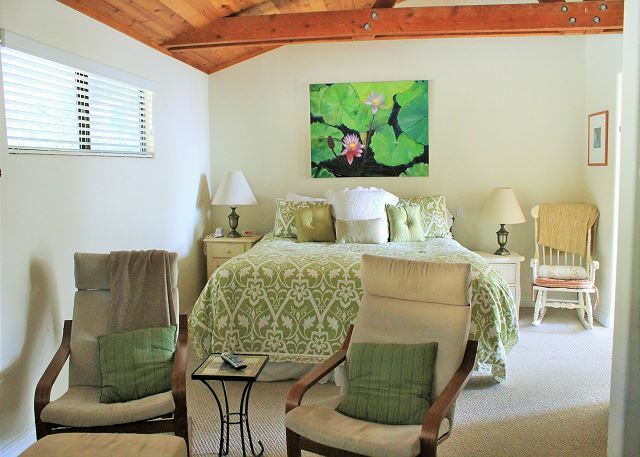 Experience complete relaxation in this hilltop cottage only two blocks from the ocean. This vacation home sits on a very quiet and private corner lot. This new HDTV is provided for your viewing pleasure. 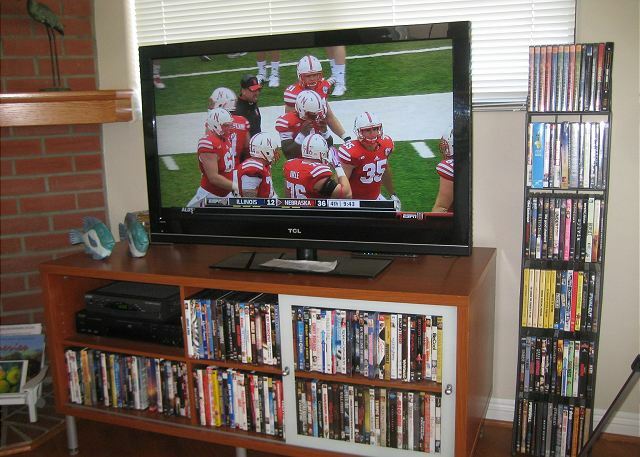 Great television for sports events and blockbusters alike, just add popcorn! Sit back and relax in this comfortable and open great room. Whether you choose to take in the ocean view from the large west-facing windows or watch the game on the new 40" HDTV, this room is sure to please. The master bedroom features a comfortable king-size bed, adjoining TV sitting area, private bath, and is privately located opposite the other bedrooms. Enjoy some quiet time in this comfortable sitting area in the master bedroom. There is a 30-inch flat screen TV for watching your favorite show or DVD. 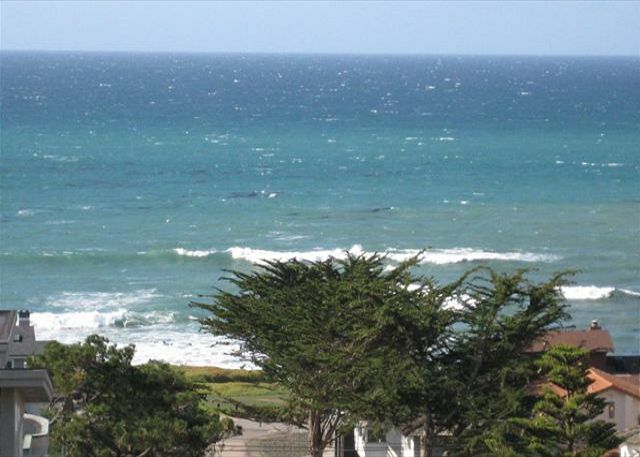 Welcome to our awesome ocean view home in the Park Hill neighborhood of Cambria! This wonderful single-level home sits on a very quiet corner lot only two blocks from the beach. It is one of the few single story homes with a hillside ocean view, and it is one of the few with no stairs in the home, making the whole house easily accessible. This home is particularly favored by persons wanting easier mobility with living space on a single floor. This is the perfect home for couples or families. The comfortable great room has panoramic window views of the northern Cambria coastline. Just outside is a deck from which Hearst Castle and the nearby lighthouse can be seen. Enjoy cozying up with a blanket on the deck chairs just outside. Off the great room, the kitchen is well-stocked with every implement you should need and gas and charcoal barbecues are just outside the dining area. The 3 bedrooms have your choice of California King, Queen, or dual twin size beds. The beds are very comfortably set with quality mattress sets. The large master bedroom/bath sits privately, opposite the other two bedrooms. Each bedroom has TVs and DVD players. A sleeper/sofa in the great room is available if needed...the home has space for 8 people. The gas fireplace in the great room makes for a cozy evening. There is a huge DVD library in the great room is stocked with hundreds of movies of all types and there are many popular books for your reading enjoyment. Outdoors, the backyard is exceptional for enjoying the sunshine or for a glass of wine on a cool evening with friends or family. The backyard wood deck area has seating for 4 and below that is a beautiful stone patio with comfortable seating for 5 more. Nearby is the incredible Fiscalini Ranch area, especially gorgeous for hikes and dog walks. 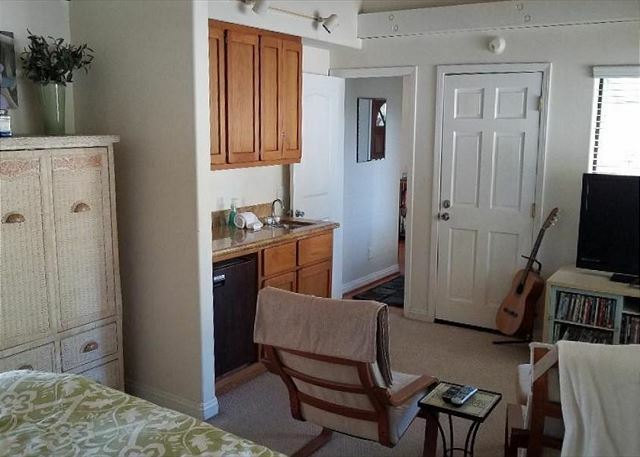 The home is only a few blocks for easy walking distance to grassy Shamel Park and fabulous Moonstone Beach. You will truly love the comforts this home provides, both inside and out! This is a dog friendly home (sorry, no cats). Bring your laptop; the home has extended range High Speed Wireless Internet! There is garage parking. A washer and dryer are provided. Bikes are available for use--just be safe! You can choose to cook on two outdoor barbecues, one operating on propane gas and one with charcoal. NOW ACCEPTING 2 night reservations in MAY 2018! During our summer months (June, July, August) this home requires a 7 night stay! As stated the house has awesome views. If it's clear you can see the lighthouse past San Simeon. The furniture is nice, comfy & well maintained. Everyone said the beds were comfy. We slept in the king & it was super comfy. The kitchen was well stocked with utensils & dishes. Nice dining table. I would say there are three patio sitting areas. One on the north side. This is the ocean view right off the living room. There are two additional out back. One is straight out of the twin bedroom & the king room. Go down a few steps & there is another one. Your doggy can do it's business here. I really like the back patios. They are sunk down (no view) it protects you from that Cambria wind and it's warmer back there. Secure enough to leave your dog back there. The north patio is not good for little dogs because there is too much of a gap between the bottom of the railing and the floor. Overall a very nice stay. We will be back. We were two couples on an early spring break at the beached found a great one. The best part of the stay were the awesome views of the ocean which were a glance or a few steps away at all times. The gas fireplace was cozy at night. Our favorite activities were walking on Moonstone Beach, exploring the local restaurants, and wandering through the unique shops. We also wine tasted at local world-class wineries. Thank you for your kind review. We are happy you enjoyed your visit and hope to host you again in the future. We stayed at the house for a family birthday during a long weekend. The view was wonderful and the location was very convenient to the beach and downtown. Check in and out was easy. The house had plenty of room. The beds were comfortable, the kitchen was well stocked,the towels were plentiful,thick and soft, and the internet was strong enough to handle our many devices. Added bonuses were the bikes in the garage and the huge CD selection. We are hoping to return some day. Nice single story home. Beautiful new patio to enjoy the warm weather we experienced. We appreciate your continued business and are happy that you enjoyed the home. The bed in the back bedroom is a queen. The room is a bit smaller which might make it appear not to be? We look forward to hosting you again. My family traveled from 3 different states and gathered at at this house to celebrate my mom’s 80h birthday. It was perfect. Great view, great location, enough space to give people their own space. The house was clean and comfortable. This is a great place to stay. We took the dogs for walks at the nearby preserve. We saw deer running down the street almost everyday. The house is very well maintained. The staff at Breen Vacation Station are very helpful. The ocean view was incredible, and exceeded our expectations based on the photos. Walking distance from town, the beautiful Fiscalini Ranch nature preserve, and a dog-friendly stretch of beach (!) Check in / out was easy, and Breen was great to work with. Some of the furniture and amenities are ready to be replaced - dull knives, broken TV remotes, old washer/dryer, no sliders on kitchen drawers. But everything was clean and cozy, and we had everything we needed. Lots of pillows, blankets, and towels! The new back yard is lovely, and fully enclosed, which is a big deal when traveling with a dog. Overall, a great house for a week in Cambria; recommended! We had a great week at this rental. (Myself, husband, 14 yearly daughter and 79 year old aunt with 2 shih tzu's) So many videos to choose from and beautiful views off of the main living area. Very close to beach (2 blocks), hiking trails, and town. 4 bicycles for use in the garage. Ample linens for use and comfortable beds. Back patio was newly landscaped and very comfortable, but it was too cold the week we booked (in June!) to enjoy much. However, very easy to use for our dogs. Previous reviews of gaps allowing dogs to get out is no longer an issue. 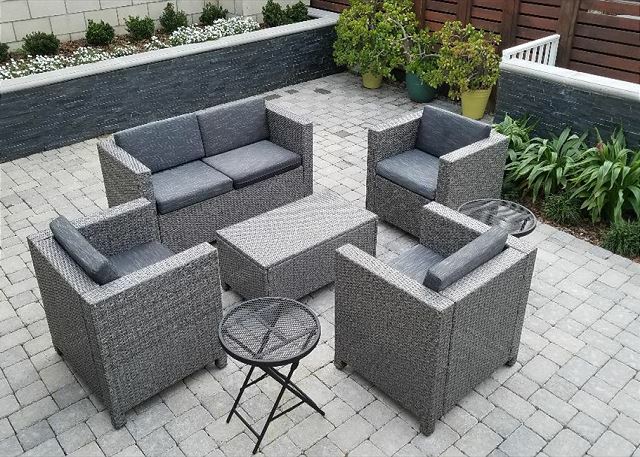 Putting in an outdoor fire pit would be great improvement for outdoor patio. Overall a great vacation stay and Breen was very easy to work with. 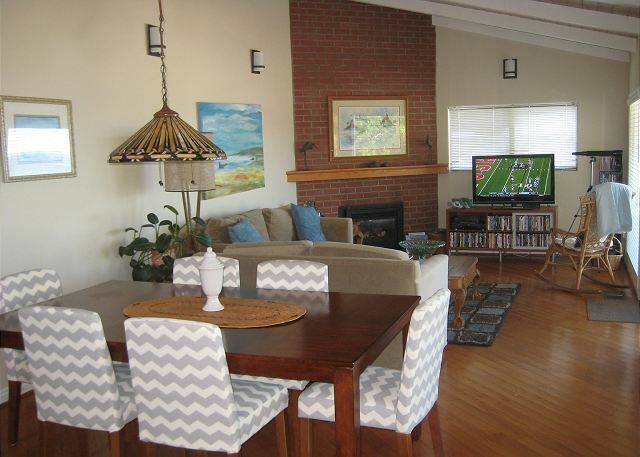 Spacious, light, comfortable home with wonderful views of the coast. Walking distance to the ocean on a steep hill. Also walking distance to a stunning clifftop walk with wonderful wild flowers. We really enjoyed our stay at this home. 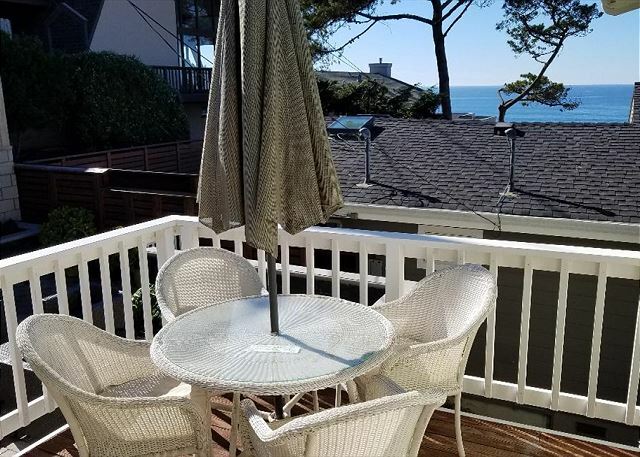 The view is great of the ocean and the sunsets are spectacular from the patio and looking out the windows. Has a nice outside area in the backyard to enjoy. Everything was very clean. The property management company staff are very nice and helpful. I hope to come back again soon. My husband and one of our friends, and our little "schnoodle" doggie had a great four nights at "Awesome Views". It's so close to the ocean, as well as to town, it's just great. Also close to the main highway to take you to locations further north (such as Hearst Castle) or inland (such as Paso Robles). It was comfortable and had what we needed to enjoy our stay. Breen is right there in town, in case you need any help with anything. Great place. Clean. Had everything we needed. CLose to Cambria and wineries. And it did have "Awesome Views" ! Cambria is one of our favorite places on the planet, and this house feels like home. 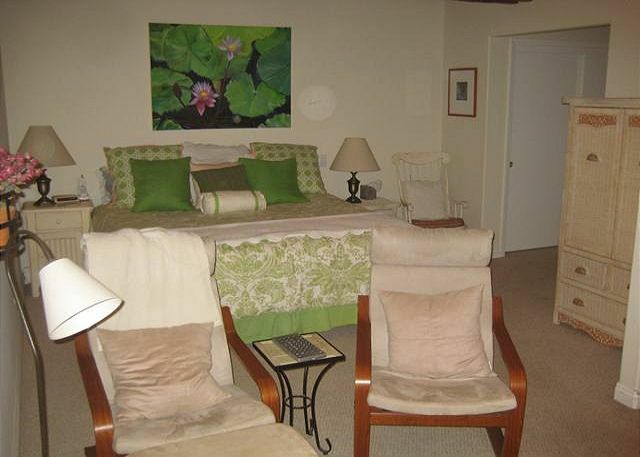 The owners ensure that you have everything you need, and each room is incredibly comfortable. This home is clean and lovely and you can hear the waves. I’m a runner and you can go for lovely long runs to the north on Moonstone Beach and to the south through Fiscalini Reserve. It is just a beautiful home in a very beautiful place. Highly recommend this lovely home away from home. Wonderful surprise! Awesome views of the ocean & could clearly see Hearst Castle too! Perfect configuration for our needs. Great location for walks too! A great find. Rain the first night gave hope for more rain in the future, and we were cozy in the house on the hill. Everything we could want from washer and dryer, fireplace, comfortable beds and two decks, one cooler and one sunnier for early suppers. Home away from home, always a joy. Overall, a great house. Some cleaning issues and lighting in the living area was terrible. Having said that, we wouldn't hesitate to rent it again. The views are amazing and the fact that it's one-story is wonderful. This is a relaxing and scenic rental! Many amenities and comfortable accommodations. We enjoyed both the stunning sunsets and sunrises from the wraparound deck. The pictures posted on Home Away accurately depict this property. We hope to visit again soon! I highly recommend staying at this beautiful home. It’s extremely well-maintained, and is provided to guests with everything you need. The bedrooms are spacious and very comfortable, the outdoor space is lush and beautiful. There are decks off both main bedrooms with easy access to the beautiful views, pine trees and outdoors. The beach is a block and a half away, with access to the beautiful walking/running trails along Fiscalini Ranch and Moonstone Beach. The small touches here are incredible, making for an amazing vacation experience. We saw both sun and moon-sets over the ocean from the main deck. Simply wonderful! We’ll be back soon! This being our third year in a row to Cambria and second at Awesome Views. It is a great place to stay and close to everything you want for a vacation of peace and quiet. The home was generally nice. However, the lighting in the home is very dim. We are very energy conscious in using electricity, it is very important to us to have good lighting. Also, some items were not working or hard to work, such as the barbecue. This place really does have awesome views! This is the second time I have stayed here and I love it. It is neat and clean. The only complaint I have is in the quality of the beds. They seem worn out and in need of replacing. Any one with a bad back will have difficulty getting a good nights sleep. Other than the beds, the place is wonderful. I plan to stay there again in the future...maybe the beds will be better by then. This home lives up to its name of awesome views. It is a comfortable home in a great location. We also appreciate that it is pet friendly as we like to bring our dogs with us to the coast. The house was spacious, nicely appointed with comfortable beds perfect for our family. The view was fantastic!! 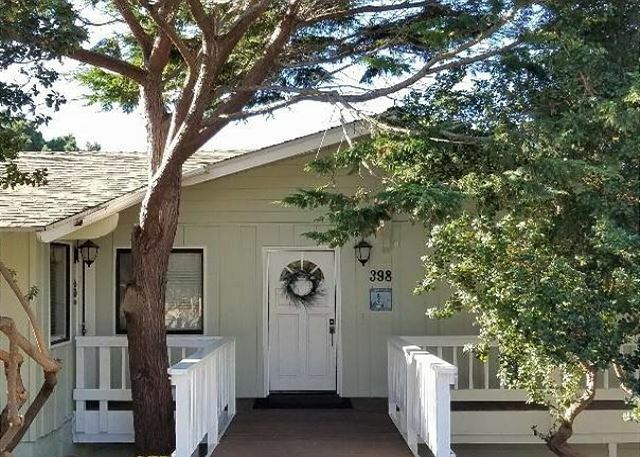 We enjoyed our entire experience in Cambria, the property manager was easy to work with and we loved the bonus perk of choosing a local bottle of wine when we arrived. The property was as described. Enjoyed our time there. Cambria is our "winter escape" since we live in the mountains of Colorado. We have stayed at several different places in Cambria in the past. This property has a wonderful view with a wall of glass and a lovely deck outside, although there is only a table to seat 2. The kitchen, although very small & with dated appliances, is well equipped and functions adequately. The home is spacious with 3 bedrooms & 2 bathrooms. The bedrooms, except for the master, are bright & cheerful. The master is very dark. The bathrooms are old, dated, need paint, & obviously difficult to keep clean. The convenience of having a washer & dryer for extended stays is wonderful! Overall, the house functions well, but is worn & a bit tired. The beds are terrible and need replacement & the windows in the bedrooms have no screens so can't be opened. It would be nice if the deck had room for a table to seat 4. This is a property our family would enjoy staying in when we visit each year, but because of the beds we may have to reconsider. We realize properties in Cambria are expensive and this is fairly reasonable in comparison. We appreciated the discount/free days for a longer stay. With new beds & some improvements we would definitely return! The art work in the home is beautiful & appreciated. Thank you for your consideration. We love Cambria and will definitely be returning! This place had all the amenities to make a perfect get-a-way. It was super clean and we loved that it was Pet friendly. It was in close proximity to the beach and Shamel Park. This home is located equidistance between Shamel Park and Fiscalini Ranch, which makes it a perfect spot for dog walkers. The ocean view is gorgeous! I was disappointed that the kitchen did not have any salt, or oil for cooking, not even PAM. Hi Trisha. Our rental homes are ordinarily not stocked with food supplies. Always feel free to give us a call if you have trouble finding anything or any problems. We had a very nice stay (thank you!) and very much appreciated the friendliness of both the property management company and owner of this very adaptable (for a fair number of people) house. It rained a lot during our stay so we very much appreciated the capacity to cook in & the house is very comfortable & homey. Never did get the fireplace to work but, for us, that was a small consideration. Nature preserve just up the hill with spectacular walking trails & views & easy access to town & boardwalk. Thank you! Not a big fan of steep hills, but view to the north was fabulous. Hearst Castle, Piedras Blanca Lighthouse, San Simeon, etc. Easy to get to town. This was an awesome place to unwind with friends and just relax. The views are amazing! Took several walks in Fiscalini Park and Moonstone Beach. Whales were visible from both Moonstone Beach and our front deck! We Thoroughly enjoyed our stay. The home is clean, comfortable and cozy. The bed and sofas were very comfy. Lighting waS well placed,and the fact that there were no stairs to deal with was greatly appreciated. We liked the house very much. Close to the water and great trails close by. Town close and easy to get to. We liked the house and would rent it again. We had a great time. This place is very close to wonderful hiking trails and had wonderful sunset views of the ocean. The neighborhood was nice and quiet. Bring your shampoo and conditioner because none is provided. We had a wonderful stay here with family and friends. The house was perfect for staying in, playing games and enjoying time together. All of the bedrooms were very roomy. The location was great as well. A quick walk to the beach and nearby park. It was stocked well with the basic kitchen necessities. The owner even called in to check on us and gave us great advice on some restuarant choices and local activities. I would stay here again and hope to someday!! We have been to Cambria many times in the past. This trip we were having extended family join us so we decided to rent a house. This house was everything it stated. Awesome views from the deck. Living room/dining room lined with full length windows. The master bedroom was huge with bathroom and other rooms were good size. A short walk down the hill to the water and community park. Easy access to the Moonstone boardwalk also. Fully furnished with every kitchen and bathroom necessities. Would definitely come back next visit. 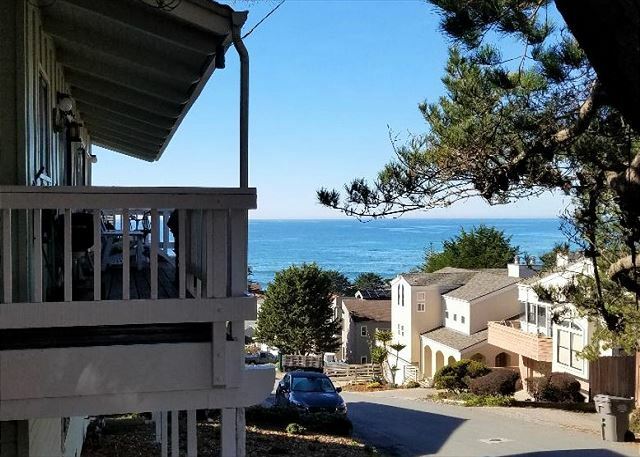 This single level home has expansive views of the ocean (at least on those days which aren't foggy!) from the living room. The house is well laid out, with a large kitchen, dining and living area that opens onto a large deck that overlooks the ocean. 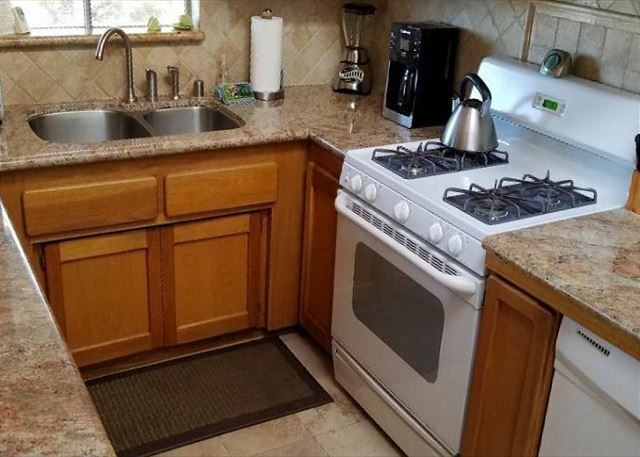 The kitchen has updated countertops and sink, and is well equipped with plenty of dishes, utensils, cookware, etc. The one drawback is that the stove and fridge are quite old - the drawers and shelves in the fridge are all cracked, the burners have very little control over the height of the flame, and the oven doesn't have an indicator as to when it reaches the set temperature. It's all functional, but could use updating. The master bedroom is very large, and has its own outside entrance (probably originally built as a guest suite). The king size bed is very soft - if you like a firmer mattress, you may want to try some of the other beds. Likewise, the sofa is very soft - to the point of being uncomfortable. There are plenty of towels and linens. Surprisingly, there was no hair dryer (although there were four curling irons!). Perhaps it was misplaced? There is a HUGE selection of DVDs to choose from which was great. And the cable selection is good (although any movie with more than a PG rating was blocked out - I suppose we could have asked to have it removed, but we were happy watching the videos). This place was awesome, and with a little updating, would be perfect! We love Cambria and this house was perfect to enjoy the view, kick back and drink wine and relax with a movie. This home was wonderful and everything that it was said to be is true. Ocean at the end of the block , fabulous sunsets and the great town of Cambria. Thank you. John Sylvestre. We had fantastic weather, which made for great views from this lovely home. Just the right size for the 3 of us. Daniel J. L from Los Angeles, CA does not recommend this vacation rental. Our first time renting a property on this side of Cambria (Fiscalini Ranch) The home was very cozy, had just about everything we needed for our stay, including all you need to cook meals at home. The living and dining area are the BEST places in the home because you have the amazing ocean views from wherever you sit! Outdoor deck is wonderful for morning coffee and watching sunsets. We only used the master bedroom since it was just two of us - and the bed was extra comfortable and cozy. Slept great there! And our two dogs really enjoyed the property as well and walking the quiet neighborhoods. We loved this place and plan on returning for future trips! The property management company was very professional and responsive to our needs as well. All around, a wonderful experience. Awesome view and service doesn't describe are experience. Breen Vacation Station was very accommodating from the beginning to the end. The house was awesome. We will come again and recommend them to anyone looking for a vacation get away. The house was exactly what we needed, welcoming and spacious for our family, including our 2 dogs. 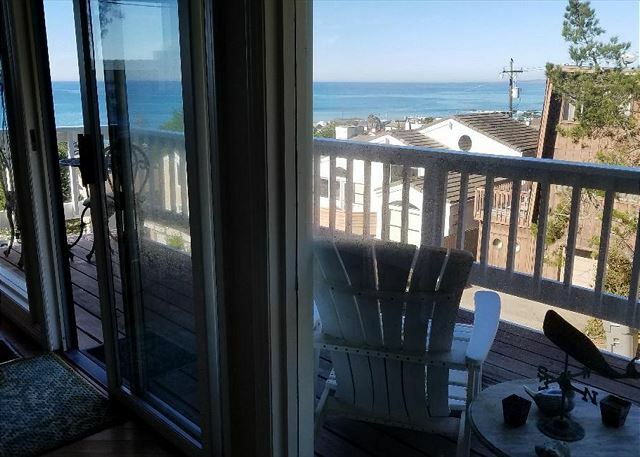 The view from the balcony is stunning, the home is located on a quiet street, you can hear the ocean waves from the bedroom. The property mgmt company was kind and answered all of my questions. Lovely weather, some flowers and the excitement of rain, thunder and lightning. 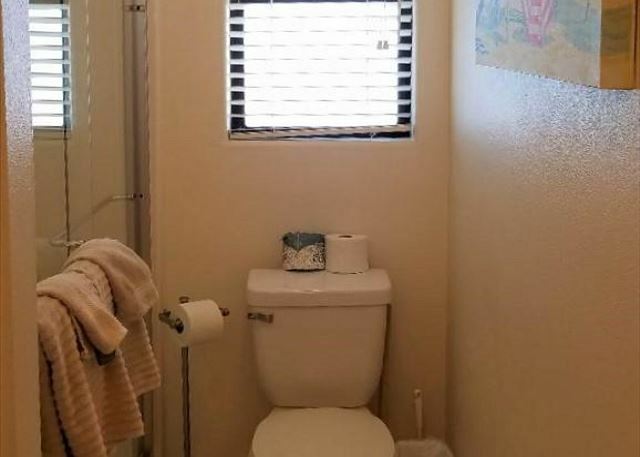 Lovely comfortable corner home with outstanding white water views. Delightfull and cheerie. Spacious,clean nicely designed home. Would rent it again. Trouble with tv in the master bedroom and in the living room. We had hoped to watch the French Open. No tv remote in master bedroom. Communication with the office was not as smooth as in the pst. Ants in the front bathroom on counter covered my eye contact case. Very tiny reddish-brown ants. I enjoyed staying at Awesome Views, as did the other guests that were on the trip. As the name of the rental states, some of the best views can be seen from the deck. 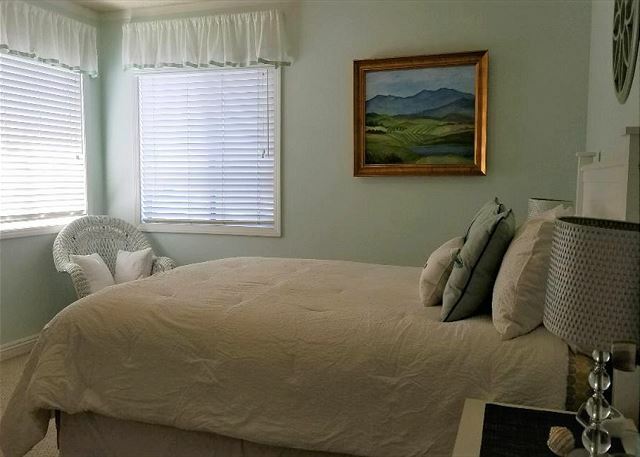 The property was clean and comfortable, easy walking distance to the beach and to main street, and in general a perfect fit for our vacation. We enjoyed our stay at aptly-named "Awesome Views" - in fact the photos don't do it justice. It is sweet and cozy, if a little well-worn. Couldn't get the fireplace to light, and had some issues with sticky blinds and broken sliding doors, but overall it is clean, comfortable, and well-stocked. We would definitely - happily - stay there again. We had a fun and relaxing stay. The house is as described. The picture does not do it justice. It is a very nice home. The location is great. The ocean views are terrific. We watched the whales head north from the deck off the livingroom. Will definately come back. Home was great and catered to all our needs. I just wish Coffee pot was clean and good. Loved it! The home was great. Although some of the mattresses desperately need replacement. I slept in the queen in the 2nd bedroom, which gave me a terribly sore back. Otherwise, all was great! We were lucky to get this rental at the last minute during Spring Break and knew it might not be ideal for our party of eight; 3 adults and 5 children ages 6-14, plus one small dog. It was a little smaller than we're used to and in a hilly area so morning walks and bike riding, etc. are a challenge. It is not so easy for kids to play outdoors in that neighborhood on the hill, but there are plenty of other places for them to play such as the beach, Shamel Park right down the street, and the Fiscalini trail. That being said, we loved the ocean view from that elevation and could hear the waves. 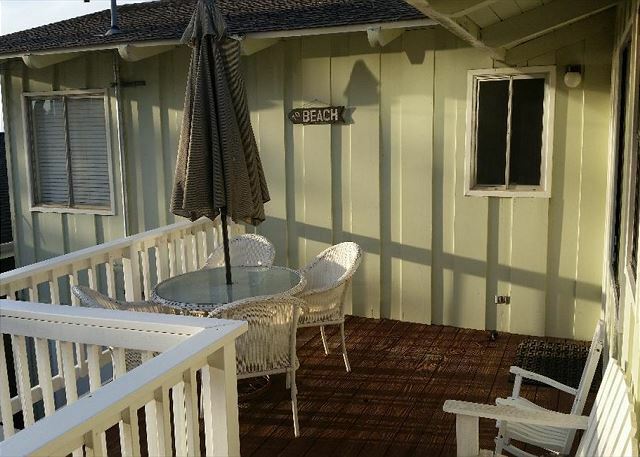 We always have a good time in Cambria, no matter where we stay, and we highly recommend Breen Vacation Station. They have always provided professional, friendly and helpful service. We had a wonderful time and loved the house except for 2 things. The twin beds were very uncomfortable and the TV did not work in that room. Other then that we had a great time and Thank you so much for sharing your home with us. We celebrated the rain all week. Fiscalini ranch has returned to his green, lush glory with a few poppies and purple asters. Waves were over ten feet, pounding all night. The glories of nature in Cabria! We loved the location and view, as soon as we walked in the door the view was perfect, more than we planned. The house was very well maintained but does need some updating. The managers couldn't have been more friendly and helpful, I would check with them again, when in that area. Perfect area for walking with great ocean views. Lots of shopping and great restaurants…. We love this family house. Well equipped kitchen and easy floorplan. The twin beds in the middle room made the kids backs hurt. I believe they need to be replaced. Wonderful home, "postcard picture" days, fantastic location. Been here before/ this our second stay. The place is very comfortable. The place could use a little TLC. The experience could only be described as ideal. Great location and view. 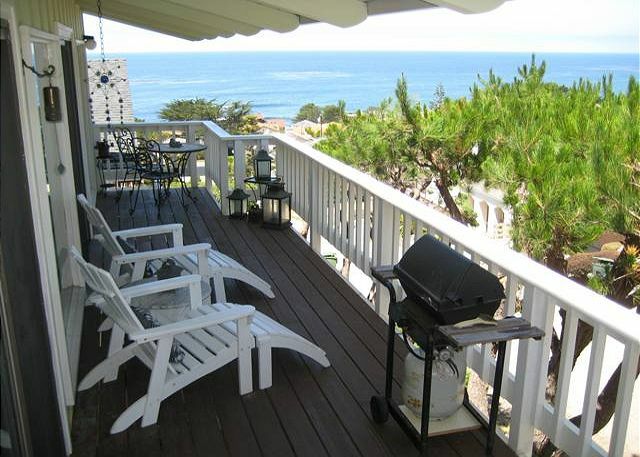 The house was well equipped and the deck was perfect for basking in the ocean view. The sights, sounds and smells of the ocean along with the quiet neighborhood were fantastic. Our dogs loved their 4 mile morning walks at Fiscalini Ranch. The people we met were all warm and friendly. We would recommend this place to anyone. As a bonus, the weather was fantastic. Humpback whales breaching, multitudes of sea birds, bottlenose dolphins, deer, otter, seals and fox made the visit magical. Very pleassant dealing with the Breen office and staying in their rental. The personal touches in our rental made it seem like home. A good effort has been made to offer a comfortable environment. Wish they offered a free night after a few days as many others do. A seemingly cozy cottage contains its own suite, extended living room/kitchen with spectacular view of the ocean and hundreds of DVDs. This cottage feels like home. Nice home, clean, some minor issues. Very well equiped, great views. This place is exactly as described. If you are looking for comfortable accomodations in a single level home, this is it. I would not hesitate to rent this house again. Love the area. The only drawback is driving to Cambria thru LA from San Diego. The traffic was brutal going home. Awesome Views was Definitely Awesome! Our Girl's Weekend in Cambria was wonderful! We all agreed we would do this more often and plan to include more friends ~ we'll continue to book Awesome Views if it is available ~ Perfect place for all of us! So well equipped and thoughtful owners/managers. The place needed some updates and maintenance. The fence for the backyard was not entirely enclosing the yard so a dog could've gotten out. We kept ours on a leash. The back yard was also a bit overgrown looking--not relaxing to sit and look at it on the balcony. The screen doors to the balcony needed replacing or at least to be painted. The adirondak chairs on the balcony needed paint. There needed to be a way to contain the dog on the balcony (ocean view side). The kitchen cabinets are old and very 70's looking. There was a window screen missing in the queen bed room. Having said that, the view is to die for. The TV worked very well. Tons of movies available to watch! Single level was wonderful!!!! I would definitely come back to this place. My husband and I plus our dog stayed for 9 days at this property. It was in a good location to explore Cambria and the beaches. (Cambria is a great place to explore the region and has great galleries, restaurants, and hikes.) The house had EVERYTHING you would ever need (except food, obviously.). The view deck is nice but can be quite windy since it is near the ocean. If you walk from the house, be prepared for some hills. The management company was very helpful. We had a very nice retreat here. We were looking for something closer to the beach, but this house had a nice view although it was a few steps away. We enjoyed the fireplace and especially the huge stock of DVD movies, many we had not yet seen, so it was movie night every night. Beds were comfortable and heat worked reasonably well. Layout of kitchen was a little funky, dishwasher was nowhere near the sink, but we managed. Free bottle of local wine is a nice touch, plenty of wine glasses in house. Nice clean home with great beds/bedding and lovely view ... take Cambridge to Whitehall if you want to avoid the steep hill. The sunsets were wonderful and it is close to town and Moonstone Drive. A definite winner. 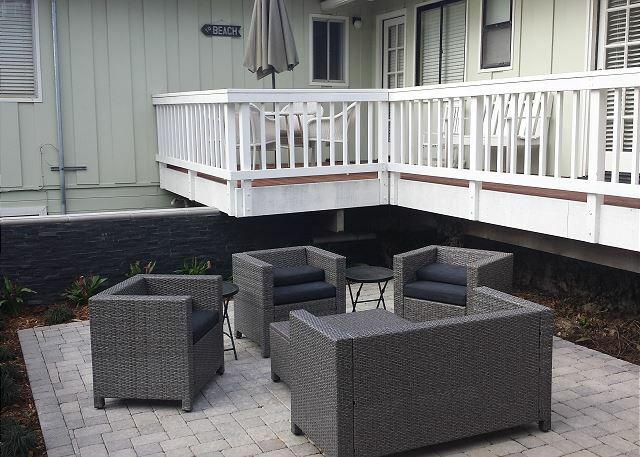 After having two horrible experiences with another vacation rental company in Cambria, our experience with Breen Vacation Station could not have been more different. They were professional and helpful during the reservation process and at check-in. The home we stayed in, Awesome Views, was a very nice home and our family enjoyed it tremendously. The views were magnificent! The home is well maintained and was very clean. 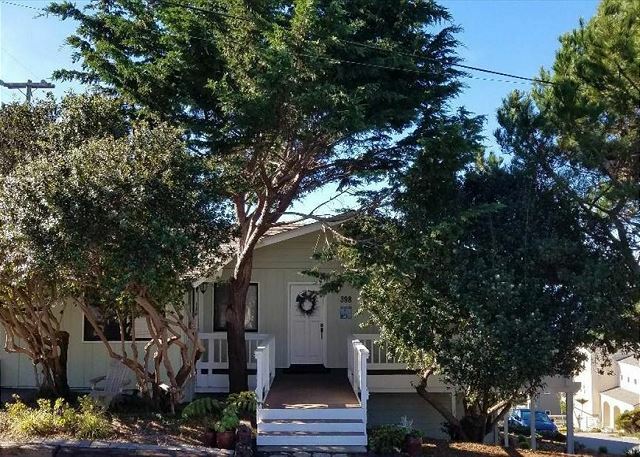 This property was suggested to us by the staff at Breen as a good one for our family with a five year old due to its location to Shamel Park and beach/tidepool access. This was a great suggestion. We also were an easy walk to town. We have previously stayed in Seaclift Estates which is lovely but the park, beach, and town proximity at Awesome Views were much better for our family. Our only issue, which was really our own fault, is that one of our family members is highly allergic to cats and this property accepts pets. We did not bring pets but it did not occur to us that this would obviously mean others would and after one night in the master bedroom, she became very sick from her allergies. Sleeping in the front bedroom with all of the bedding removed helped, and she was not able to come in the home at all (fortunately the deck was lovely!). So I would recommend if you have anyone with a pet allergy, this would not be the home for you. Otherwise, it was a perfect place for our family vacation! This was our 21 year renting a house on Park Hill. The beach, tide pools, ranch and park were all just a short walk away. Awesome Views was a nice house, all on one level, with an awesome view of the blue Pacific. The home fit our needs perfectly and our two small dogs and three grand kids had a fun time. A wonderful 10 day stay went by ever so quickly and we hope to return next year. Thanks to all the helpful Breen staff. There were so many pluses to this house. DVD's, telescope, fully stocked pots and pans, garage opener, laundry area, plenty of towels, etc. Love the wrap around front porch. If you like hills, this is it! thanks. We loved our stay in Awesome Views! The house was very comfortable and the view was truly terrific. This house was perfect for our family of four. We appreciated amenities such as the garage, laundry facilities, two decks, and three bedrooms. We loved bike riding the hills at the nearby ranch and were treated to dolphins playing in the surf at Moonstone Beach one evening. We loved our vacation at Awesome Views! We were thrilled and would LOVE to stay here again in the future. If I had to pick 1 small thing to improve on it would be the quality of the BBQ grills. Both were rusty/dirty and I was a bit worried about cooking on them. I think a cleaning or even a better BBQ brush would help. Not a deterrent, just a suggestion. We did love our stay and will recommend to anyone staying in the area. The vacation home was peaceful and relaxing with magnificent views. This was our 2nd visit to Cambria, which is the perfect half-way point for my friend who lives in San Francisco, and I who lives in Diamond Bar, to meet. The house was perfect.....immaculate, tastefully furnished, and very well stocked with anything a person might need on vacation. The view was awesome as advertised and the location was very close to town yet quite and peaceful. We enjoyed our daily excursions to Big Sur, Morro Bay, and the terrific Farmer's Market in San Luis Obispo. Also highly recommend Linn's for any meal as well as take home goodies for desert! Some rental properties have a good location and some are decent homes as well. Awesome Views tops my list as it has a great location and is also a great home. 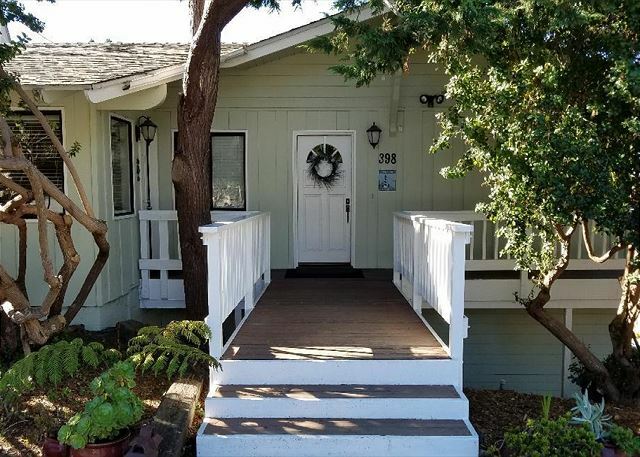 A few short blocks to the Fiscalini Ranch open space for several walks with views with our dog, Sadie; close to Shamel Park, and walks along Moonstone Dr. or into Cambria itself. Car only needed for wine tasting day trip. The home is perfect. 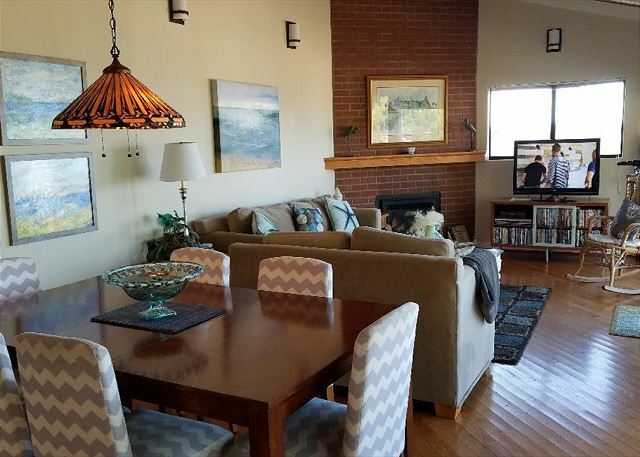 Great views from inside and decks (2), lots of windows and light, one level, super kitchen, big TV, comfy bed, gas fireplace, wifi, even bikes to use. The owner's call to see if all ok warrants an extra kudo. The staff at Breen were also very professional and friendly in person and on the phone. What more could we ask? We'll be back! Quaint, Cozy and Phenomenal Views! I absolutely loved this Vacation Rental! The views couldn't have been any better, with lots of space out on the deck. The rooms were all equipped with tvs (which is one of the reasons my family wanted to stay here - I know who watches TV when you have perfect views!? Crazy people.) But there were so many DVD's to choose from, so at night you can gather in the family room and hang out and make a selection from their enormous collection. The kitchen was fully stocked with lots of plates, glasses, utensils, cookware, bakeware, etc. What made our stay even more welcome, was the owner contacting us and letting us know that he was available if we needed anything. Amazing! I would happily recommend this Vacation Rental to my friends and family! Breen Vacation Station - I've worked with you twice already and you folks are fantastic to work with! You are so friendly and open to answer any questions that i've had regarding houses and payment. Thank you for making staying at a Vacation Rental that much easier! IT WAS WONDERFUL AND ALL 5 OF US ENJOYED EVERYTHING ABOUT IT EXCEPT FOR THE FACT WE HAD TO LEAVE. Three of us and our dog stayed 4 nights in this gorgeous house. The views were as fabulous as they had been described and the house itself was extremely comfortable, well-stocked, and perfectly-located. The owner phoned us personally on the evening of our arrival to offer us any assistance we might need throughout our stay. It was a very nice touch but as it turned out everything went smoothly with the rental. Once settled, we were able to completely relax at this home. We hope to return again soon. Awesome Views is Truly Awesome! Dear Breen Station and John and Charlotte! We want to thank you so much for allowing us to stay in your beautiful home, Awesome Views! Truly, not only are the porch panoramic views of the Cambrian coastline amazing...your home is exqusite! Everything that any vacationing family could ever want was all right here! So warm, comfortable and inviting! And, our favorite touch is Charlotte's beautiful oil paintings displayed in this gorgeous home! What a wonderful time we had...watching a buck with antlers walk on the path...the monarch butterflies around the flowering bushes on the porch...and the dolphins gliding across the ocean! 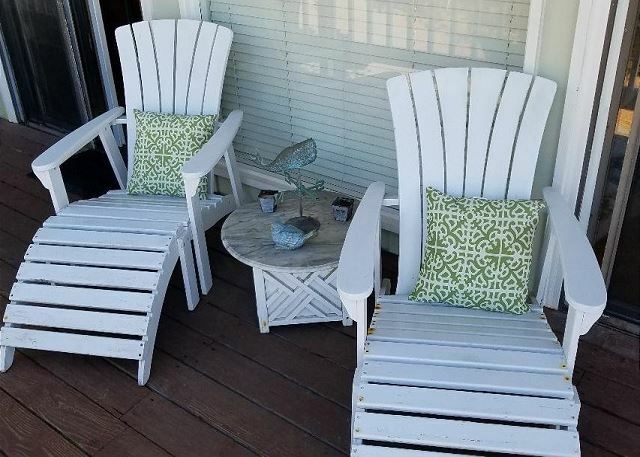 We love Cambria very much and vacation here many times throughout the years..and your home is our absolute favorite from any other place we have ever stayed! Awesome Views and a truly Awesome Home! Thank you All so much again for making our vacation so spectacular! And for your kind help in finding such an amazing place for our family to stay! We would love and hope to spend our next vacation here once again! There were four of us on a "College Friends" girls weekend. The house was in a great location and had a fantastic view of the ocean. The house had three bedrooms with one king, one queen and two twins. 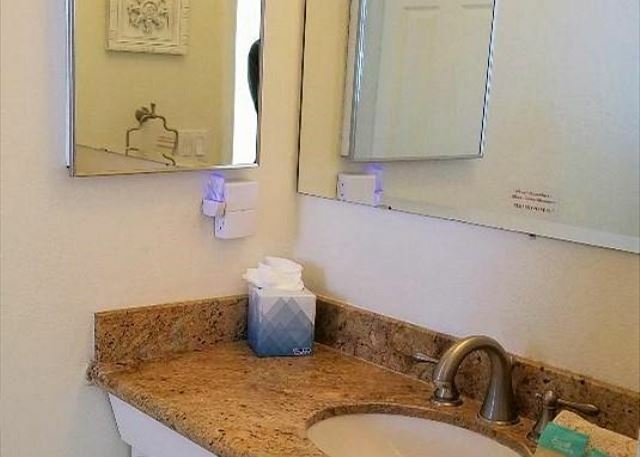 The electrical outlets didn't work in one bathroom but after letting the rental place know, the owner of the house called and asked if he could come by and fix the problem. He was very nice. The house was stocked with everything we could need to cook. The house was nice and bright. The living room had a couch, a loveseat and a rocking chair. The loveseat was not as comfortable as the couch but it was ok. Overall, we had a great time and would stay in that house again. Wow, we really got lucky with this home. There were many to choose from, but this one has everything. We enjoyed the decor, organization, the layout, & of course, the VIEWS! Awesome View is an awesome house! This vacation rental was all I had hope for and more! It was very clean and in great shape. The rooms were funtional and not too fussy. We felt right at home. The decks were an added bonus, like having extra rooms. We hope to return to Cambria again and will definately use Breen. Excellent for those looking for a home that is all on one level. just wonderful in almost every aspect. Loved staying there, close to beach and close to Fiscalini ranch for bike rides. We enjoyed bike rides, walks, beach combing, and bar-b-quing at the house! Had a great time. Place is beautiful, well maintained, and affordable. We love renting from Breen Vacation Station. on the down side, please reiterate to the owner, vacation renters don't want to be "checked up on". Had another great stay on Happy Hill. Best spot to stay in Cambria. Close to everything and the views were indeed AWESOME! Cambria is such a beautiful location along the Central Coast. The location of this home was perfect. 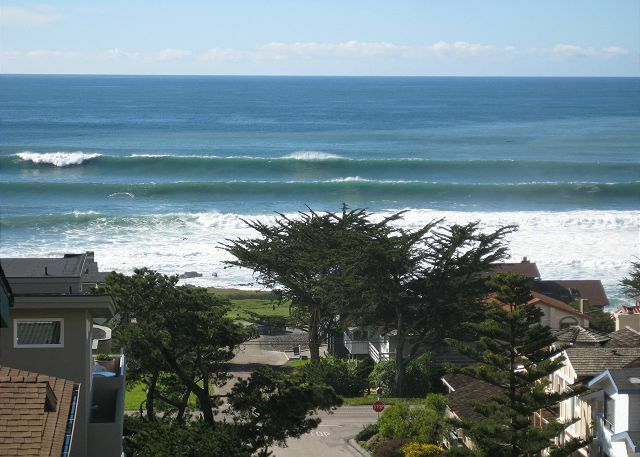 It is only minutes from Moonstone Beach. We enjoyed nightly strolls along the boardwalk. The home's views are beautiful. You will be surprised to see the views are better than all the photos shown. The owner has thought of everything to make your stay enjoyable. 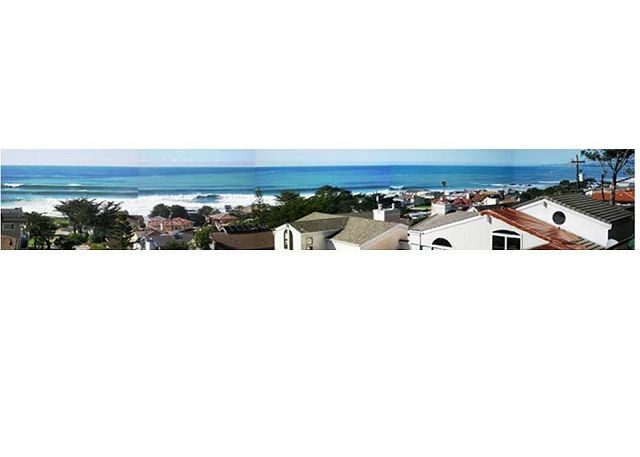 We so enjoyed staying at Awesome Views in Cambria!! The layout of the home on a single level was perfect; with plenty of room separate from the Master bedroom for our Family & Friends who visited us. The kitchen was well-stocked for folks like us who love to cook. With only two blocks to the ocean for walking and about three to Fiscalini Ranch for more walking, we came home reasonably fit. What fun we had touring the nearby town and wineries!!! We will definitely want to return here soon; and, so will our friends who visited us there. Overall, very wonderful getaway. Suggest at least one other and larger cutting board. Gas bbq grill was out of fuel (too much trouble to change out tank), so used the charcoal one which had a piece of last occupant's meat product on the grill and all the ashes. would be nice to have the cleaning service assure gas in the tank and a clean grill. gas grill looked very old.